In partnership with Platinum Jewelry. Bands range in style from pave encircled sparklers to chic metal-only classics and everything in between. So, to help you figure out which look is right for you, we’ve partnered with Platinum Jewelry, to bring you 4 things to consider when trying to pick out the perfect band. You’ll wear your wedding band every day of your life–and it may even get more wear than your engagement ring. (Some ladies wear only their bands when hitting the gym or running errands, while others even opt to transfer their engagement rings over to their right hands post-wedding or only wear them on special occasions.) Suffice it to say, your band will be getting a lot of face time with the world. Therefore, you want to look to your personal style for clues on the type of band you want. Bling-loving brides often choose rings with large stones, while bold brides may go with a mix of diamonds and colorful gems. 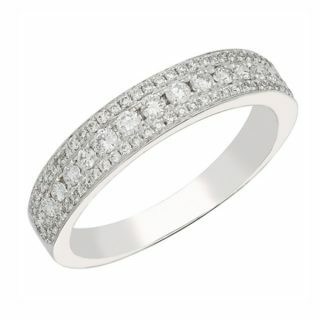 Others opt to keep their bands classic with smooth or engraved metal like platinum, in its stunning natural white color. If you like the idea of having an all-in-one ring, consider a chunky band—with or without diamonds— that could serve as both an engagement ring and wedding band. Another factor to consider is your day-to-day life. If you’ve got a very hands on job or you’re super active, a simple band or an all-in-one engagement-and-wedding-ring might be ideal so you can either keep your ring on without worrying about it, or so you only have to take one ring on and off during work hours. Platinum may be a good pick too, because it’s dense and durable, and won’t change shape or wear away. Overall, you want your ring to fit with your routine. Make sure to choose jewelry that makes sense for you to wear every day without having to fret over it or having it become an annoyance. It may sound a little silly, but you do want to consider how often you like to do upkeep on your band, as this will influence your choice of metal. Upkeep, you say?! Yes. White gold, for example, needs to be re-dipped every year in order to maintain its shiny sheen. Platinum, however, won’t change color over time. Plus, it holds stones more securely than other metals and requires fewer tune-ups at the jeweler. While some metals break, you can rest easy knowing that your platinum prongs are tough (and your precious stones won’t go MIA). Your wedding ring is the foundation for your other everyday jewelry, so keep this in mind as you make your choice. 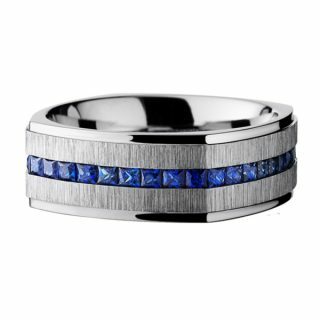 You may choose your metal or stones based on other pieces you already have, or want, so they all coordinate when you wear them, or you may love the idea of mixing metals—platinum pairs perfectly with just about any other metal—and want your band to be different than everything else you put on. Another consideration is whether you want to build a “stack” on your ring finger and add more small bands for major anniversaries, birthdays, and future children. In this case, starting with a pave or plain platinum band will make a great foundation you can add more rings to. Get more ring inspiration on Loverly!